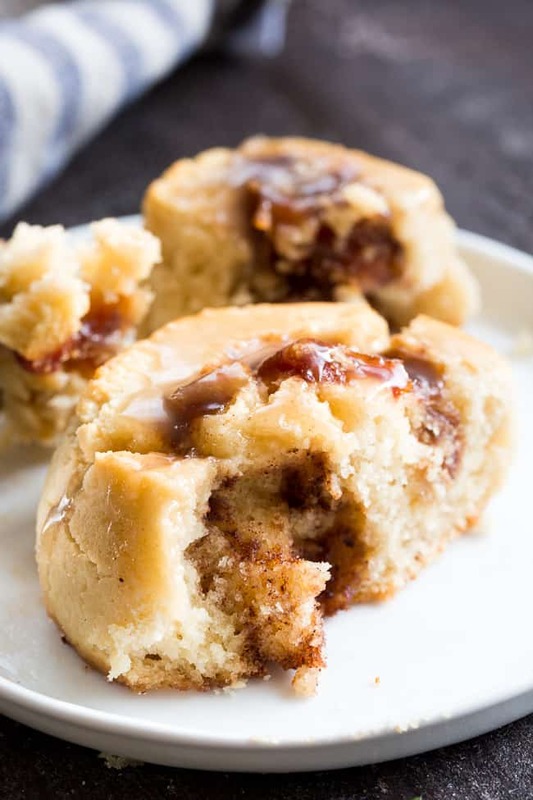 These classic paleo cinnamon rolls begin with a one-bowl dough, have a maple cinnamon filling and dairy-free, sweet and gooey white glaze drizzled on top! They’re soft and chewy on the inside with a chewy crust on the outside, making the texture just as irresistible as the flavor! 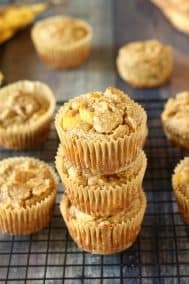 Family approved, perfect as a special breakfast treat or snack anytime! These paleo cinnamon rolls have been my not-so-little project over the past couple of weeks, and I’m THRILLED that I finally got the recipe to come out just as I wanted it to! The dough, as written in my dinner roll recipe, has two “problems” when it comes to turning into cinnamon rolls. First, it’s too sticky to press out. Second, even when I chilled the dough it didn’t “roll” properly – it needed more stretch! No point in filling delicious cinnamon rolls that don’t actually roll up. So, I turned to the flour that’s known for being stretchy – tapioca! I rely on tapioca flour in many of my recipes to mimic the “chew” that gluten typically provide in traditional baking recipes. I used quite a bit of it in my pizza crust and dinner rolls, but for this recipe I knew I’d need even more. I settled on 1/2 cup more tapioca flour than my dinner roll recipes calls for, and with maple syrup added to sweeten, the liquid/dry ingredients balanced well. Even still, this recipe might take just a bit of practice before knowing when the dough is the right consistency to press out, roll, and cut. I provide detailed instructions within the recipe itself regarding when and how long to chill before each step, to make it easier to get it right the first time! Below, you’ll see the “stages” of the dough. The top left photo is the dough after mixing and before chilling and the top right shows it after chilling for 15 minutes in the fridge. From there, I place the dough in a ball on parchment paper sprinkled with more tapioca flour. The tapioca is necessary to keep the dough from sticking when it’s time to roll! I then used the heels of my hands to gently press the dough into a rectangle, as shown in the middle right photo. I made a couple of batches of these cinnamon rolls with dates, one with raisins and one with both. I honestly think this part is preference – the dates make it “gooier” and the raisins are great if you NEED raisins with your cinnamon! The last photo above is the filled dough, after I chilled it in the freezer (again, all described below!) and cut into segments. You can gently use your hands to shape them nice and round before baking. I recommend baking them on a parchment lined baking sheet about 2 inches apart from each other. Lastly – the topping! I created a sort of sweetened condensed coconut cream by boiling coconut cream with maple syrup until it reduced and thickened just a bit. If you continued to cook it this way – you’d get caramel, which wouldn’t be at all bad, but if you want that white-glaze-y look (while letting the maple flavor shine through), don’t let the mixture caramelize! The topping can be made ahead of time (what I did) and stored in the refrigerator until ready to use – up to about 4 days. 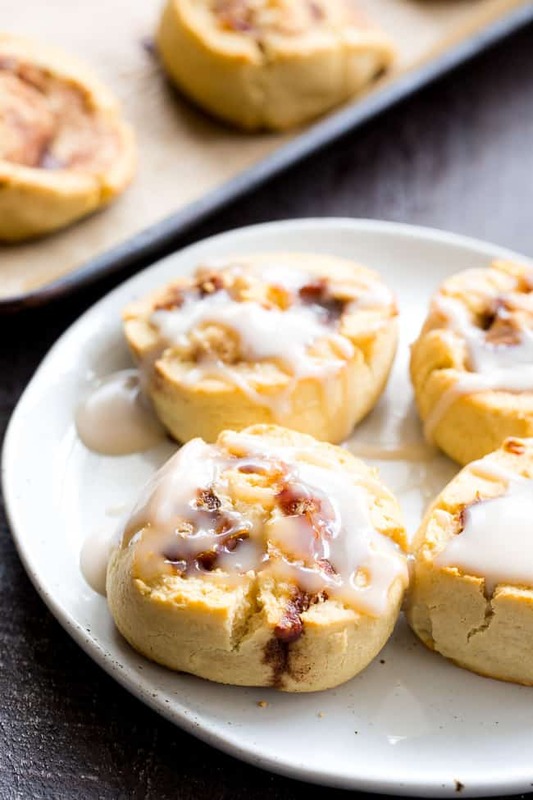 The cinnamon rolls themselves should be served warm (or fresh-out-the-oven, if you will) and any leftovers can be frozen (while still fresh) and reheated covered in aluminum foil in the oven. Or so, this is what I’ve been doing with my leftovers! I hope you guys are ready for a HUGE treat! Let’s dough-make, roll, and bake! 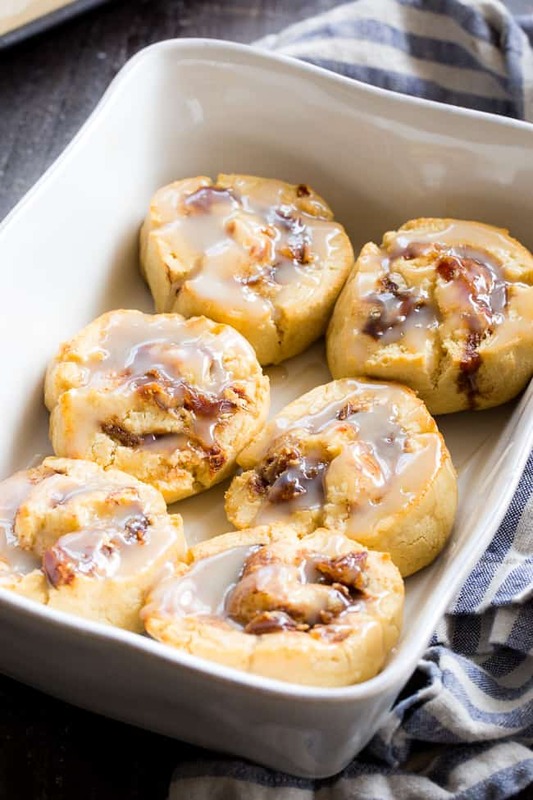 These classic paleo cinnamon rolls begin with a one-bowl dough, have a maple cinnamon filling and dairy-free, sweet and gooey white glaze drizzled on top! They're soft and chewy on the inside with a chewy crust on the outside, making the texture just as irresistible as the flavor! Family approved, perfect as a special breakfast treat or snack anytime! 1/3 cup warm water not hot, warm enough to keep butter melted or coconut oil melted! In a large mixing bowl, combine the almond flour, 1 cup tapioca flour, 1/4 cup coconut flour, baking soda, baking powder, and salt. In a measuring cup, combine the melted butter, water, apple cider vinegar, maple syrup and vanilla and stir. Pour the liquid ingredients into the dry and stir until fully combined. Add the egg and continue to mix. Lastly, add in the second part of the tapioca (1/4 cup) and coconut flour (2 Tbsp). Mix until well combined - dough will be sticky. Chill dough for 15 minutes. At this point it should be firm enough to handle with some help from extra tapioca! Sprinkle about 1 tbsp tapioca over a large piece of parchment paper, placed on either a large cutting board or baking sheet (so you can transport dough to fridge easily! ), then place dough in the center. Sprinkle more tapioca on your hands and top of dough to help press dough into rectangle, about 10 x 7”. I find that using the heel of my hand to work the dough into this shape is most efficient. 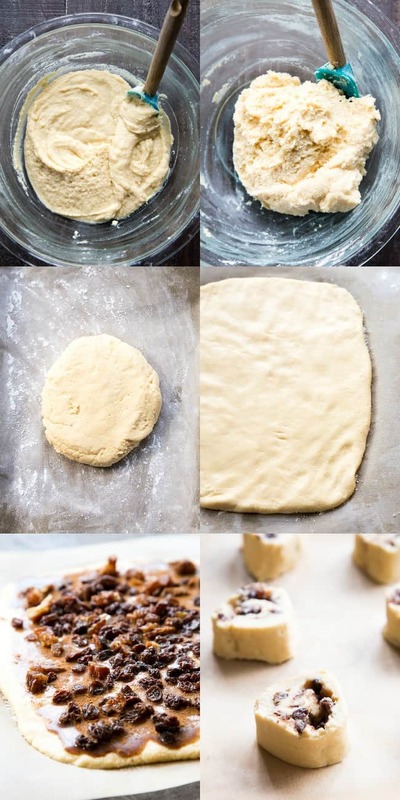 Once dough is spread, whisk together maple syrup and cinnamon and brush all over dough, then sprinkle more cinnamon and the raisins/dates over the top. Roll dough on the long side (so your roll is wide, about 10”. Use the parchment paper that’s underneath to help you carefully roll dough as tightly as possible. You won't be rolling the parchment WITH the dough, but rather using it to guide the dough so you don't have to touch it. Because dough can be sticky, you may want to chill again before rolling if you find dough sticking to parchment paper. Once rolled, gently seal the end and chill the roll in the freezer for 10-15 minutes (it will have softened a lot at this point) so you can easily cut it. While dough chills, preheat your oven to 350 degrees and line a large baking sheet with parchment paper. Bake in the middle rack of preheated oven for 20 minutes or until just done and beginning to brown on top. In a small saucepan, bring coconut cream and maple syrup to a boil. Lower heat, allow to boil/simmer, stirring occasionally for 5-10 mins until syrupy (like sweetened condensed milk). Then, stir in vanilla and salt. It will thicken as it cools. Allow it to cool, or refrigerate before using. 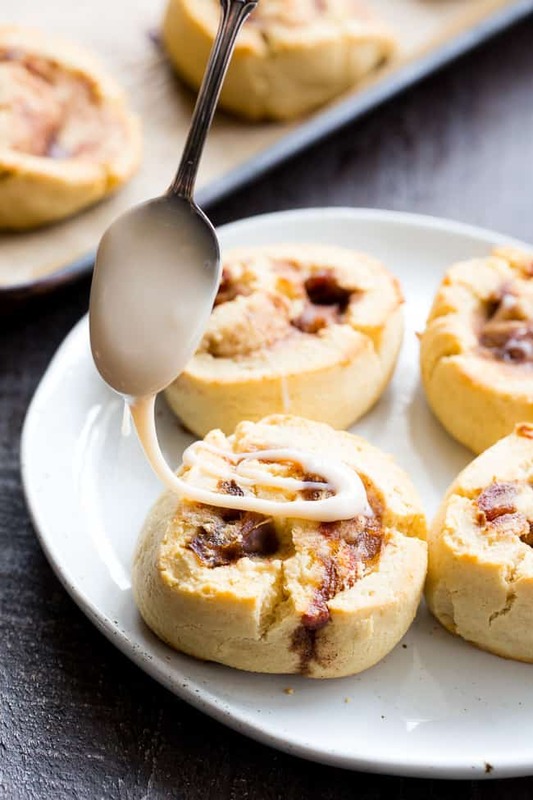 Prior to serving (cinnamon rolls should be served still warm) drizzle topping over rolls with a spoon. You can also add chopped nuts if desired - enjoy! *Topping can be made before beginning, or ahead of time, and stored in the refrigerator until ready to use. Ok I’ve been meaning to write and you – do you consider Swerve non-paleo?! I’m bouncing between Paleo and lower carb and thought use of granulated Swerve could really reduce the carbs in this and or other recipes. Curious your thoughts as you are so well versed in the Paleo baked goods! Happy holidays! I haven’t used swerve and don’t know much about it. I haven’t experimented with low carb baking at all yet. THANK YOU!! I have been searching high and low for such a recipe for Cinnamon Rolls and to no avail, until this morning. I’ve been craving a great, grain free cinnamon roll dough that has some stretch as you say, that I can use for a lower carb version. I’m diabetic so unfortunately the delicious Maple Syrup is out for me, but this will be perfect with Swerve confectioners sweetener and Cinnamon and maybe just a sprinkle of Coconut sugar too. Thanks again and Merry Christmas! These cinnamon rolls look amazing!!! Hi Michele! What a yummy recipe! I am wondering if there can be a substitute for the tapioca flour- like arrowroot? I’m not sure arrowroot would work here for the texture, and since it’s such a large amount I’m not sure I’d want to recommend trying just in case it doesn’t hold up. Can’t wait to try these!! Thank you for all of your recipes!! Can these be frozen before baking and then baked later like on Christmas morning? If anyone else also knows the answer please help in case Michele doesn’t see this soon. Baking today for Christmas. Thank you! I made these the day before Christmas, stored the rolled up dough in the fridge and then sliced and baked Christmas morning. They were so yummy!! Thank you for your recipe and all of the time and effort you put into making these just perfect!! It has allowed me to enjoy the special moments with family without having to compromise my lifestyle change to paleo. Michele, Can I make the dough and totally prepare these ahead of time and freeze them, and bake on Christmas morning? If so, would I thaw first or just bake from frozen and at what temperature/for how long? Sorry about all the questions!! Thanks!! I would recommend prepping and storing in the refrigerator until ready to bake, I’m not sure how they would bake being completely frozen first. Then from the fridge, just bake as instructed. Hope this works out! Merry Christmas they turned out amazing! Puffed up, great texture, soft and baked on the inside and a bit crunchy on the outside and just the right amount of sweetness!! I ended up freezing the dough (they were fully prepared), then last night before bed I transferred the pan to the fridge then straight into the oven this morning as they had thawed perfectly! Another hit!! Joining the advance prep crew. If anyone experiments, let me know. I plan to make these tomorrow. Thanks! Thank you for doing a great job…all of your recipes I’ve tried are delicious. I’ve read the instructions numerous times, but I do not see the baking powder added. Please advise. I just happen to be making these now and noticed it in the first line with all the dry ingredients. Hope that helps! Merry Christmas. Thank you for such a delicious recipe! 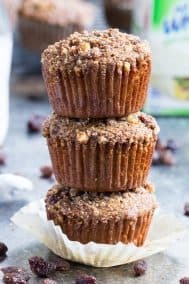 I was looking for something to satisfy my sweet cravings without all the processed sugar, and these were AMAZING. The one issue I came across, is that it was impossible to roll. I tried, I really did, and it broke right away. The one mistake I made was putting all of the coconut and tapioca flour in, instead of leaving the tapioca (1/4 cup) and coconut flour (2 Tbsp) for after the egg. I misread the directions. Could that made the rolling more challenging? 5 starts for the taste!! I only did 4 stars because of the rolling. What would you recommend for an egg sub? Gelatin egg? Flax? Apple sauce? Thanks for the tip. Going to try these soon and I may use this method to avoid chunks. Can you substitute almond flour? I’m allergic to nuts. I miss cinnamon rolls so bad, this makes my mouth water! These look like perfect cinnabons! I’m so excited to make them. I just made these and they were way better than another recipe I had. First of all, they rolled up perfectly. I’ve never been successful with that part. The dough was a little crumbly but didn’t seem to matter. We left out the raisins just because! I put them in a pie plate so it would be a pretty circle- They have been in the oven for 32 minutes now – I ate one after 25 minutes and it was doughy on the inside. The taste was delicious but texture underdone- could be because I smooshed them too tight in the pan. Hopefully, the longer time in the oven will take care of that. Could you make the dough the day before and chill in the fridge overnight instead of the freezer step? Thank you for the great recipe, my 1st make, in the oven, but they don’t look as yours! i need practice. 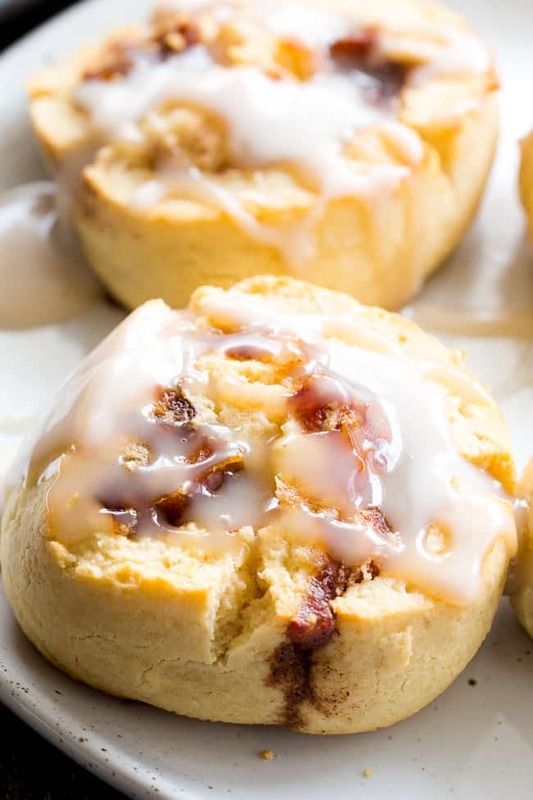 Hoping they will be my go-to replacement for the Jenny Craig cinnamon rolls I love! I don’t have coconut cream for the. Icing. Can you suggest a substitute? If not, I’ll freeze them until I have the right ngredient. I’m a beginner at preparing & eating Paleo, hoping its the beginning of better eating for me. I want to be in tne club, thanks for your help! These totally fulfilled my craving for cinnamon rolls! Great recipe- easy to follow, great Sunday morning baking project. I will definitely be making these again! The cinnamon Rolls were yummy but they were not like yours. They did not rise at all and were more like a cookie consistency and they were not light in color like yours. Even though I followed the recipe to the letter (I am a professional baker. I owned my own cake business for years) could it be because of the type of Almond flour I used? It was not blanched, just almond flour. Do you think that if I use more tapioca flour it will rise? That being said they tasted amazing and the Drizzle on top just took it over the edge!!! I am really loving your recipes. Do you have a paleo cookbook in the works? I would buy it! I have made these cinnamon rolls at least a dozen times for my paleo boyfriend. Cinnamon rolls are his favorite treat and nearly every weekend he asks me to make them again. I don’t do the topping prescribed in the recipe. Instead, I use non-dairy Daiya cream cheese and make my own icing. Highly recommend this recipe!!! Have you tried Bob’s Red Mill new paleo flour? It’s a mix of almond, coconut, tapioca, and arrowroot. I’ve made scones and waffles so far. Really nice. But I haven’t found many recipes out there for it yet. Nope I haven’t tried it, sounds good though! I really want to make these for Christmas morning, but my toddler is egg free. Do you think a flax egg would work? I can always make him a separate treat, but it would be fun if he could have the same yummy rolls as us. Thanks! Hi! Could I make this vegan as well by swapping out for miyokos vegan butter and a flax egg? 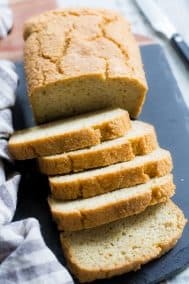 Can you substitute coconut flour for a different flour? These were wonderful! Although there are a number of steps, they were very easy to make! Thank you for this great recipe! i am confused. do you add the warm warm water with the ghee etc. Sadly these ended up in the bin. The “pastry” was dry and crumbly, not sticky when placed in the fridge and therefore just ended up more dry and crumbly. Tried adding some more liquid ingredients and were still crumbly when I tried flattening them out. No way these would of rolled up, so the mixture ended up in the bin. I made these for Valentine’s Day and they are definitely a labor of love. Took a while to make and there are a lot of steps but they are so worth it. 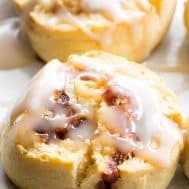 Ive only had cinnamon rolls maybe three times in my entire life but I loved these! They were a little dense and starchy but I loved the flavor and texture overall. It was such a treat because I had been craving a cinnamon roll and the ones at the grocery store were so dry. I made traditional cream cheese icing for these and they were really delicious! Thanks for creating this recipe! These were DELICIOUS. I subbed tigernut flour for the almond and they turned out perfectly. The tigernut gives them a wee bit more sweetness.. so good. Thanks for another fabulous recipe! Do you think a flax egg or Chia egg would work as a substitute?